I've never bought your products before but this was is interesting to me. What rule set are the scenarios designed for? We play battalion level Shako 2. 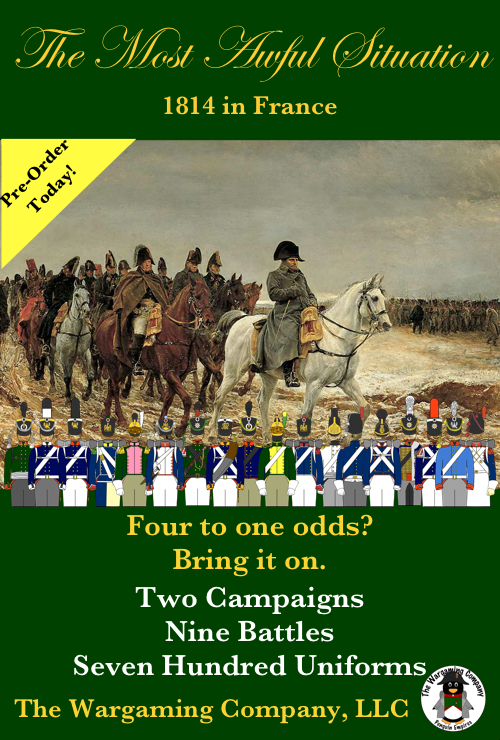 Our ESR Napoleonic Campaign Guides can be used with nearly any tabletop Napoleonic rules set. The maps are in scale miles and the introduction to each campaign provides a table showing what size table is needed at a variety of ground scales so that you can know that with Shako II you need a table X by Y feet for a given scenario. The time of events is always given in time, not turns, so you can always map start, end, and arrival times to the number of turns appropriate for your chosen rules. The orders of battle go down to the battalion level. While we are not able to provide the strength level of each battalion – because this is quite rarely available with any sort of consistency – we do provide average strengths for the campaigns included. The only "rules specific" factor generally included is the rating of the Units and Commanders for the scenarios, however, we provide an online conversion table for approximately two dozen rule sets (that include Shako II) where you can see what the included ratings translate to in your chosen rules. Reference was to the guide "We Will Meet in Vienna" 1813 in Germany, which ends with !st Kulm in August 1813 and then the new guide "The Most Awful Situation" 1814 in France. We still need a guide for late 1813. We still need a guide for late 1813. Any chance you will do 1807 the campaign in Poland? Oh most definitely… exactly when is a little harder to say.